World O! Water is an annual event hosted by the City of Omaha at Lake Wehrspann, a large man-made lake in a dam retained waterway constructed by the Papilion Missouri NRD. This dam site has evolved into its characteristic biome over the years. AcademyScience.us presents one of its CEENBoT robots that may be operated by youth or adults with a game pad controller or programmed to complete a list of instructions automously by way of a computer program with output compiled and downloaded to the robot. Big thanks to all who turned out and shared! We enjoyed meeting and hearing from you! 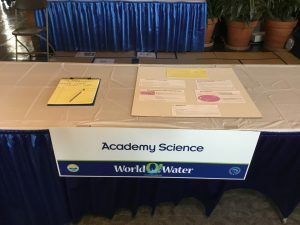 AcademyScience.us Supports the Community! This entry was posted in Science Calendar and tagged Academy, Academy Science CEENBoT, Academy Science Club Art, Academy Science Club Civics, AcademyScience.us, Biology, Computer Science and Engineering - CSE, Demonstration, First Lego League, FLL Trash Trek, Global Youth Service Day, GYSD, Natures Fury, NXT Mindstorm, Physics, Prepare, Robot, Science, Science Calendar, STEM, TherapyDog, WorldO!Water, WorldOWater.org. Bookmark the permalink.